ADAPTIVE INNOVATION · Portfolio: Bigger Risk = Bigger Reward You have to play to win CHAOS AND RISK share many similarities. Both concepts cause orga- nizations to retreat and yet each creates opportunity. 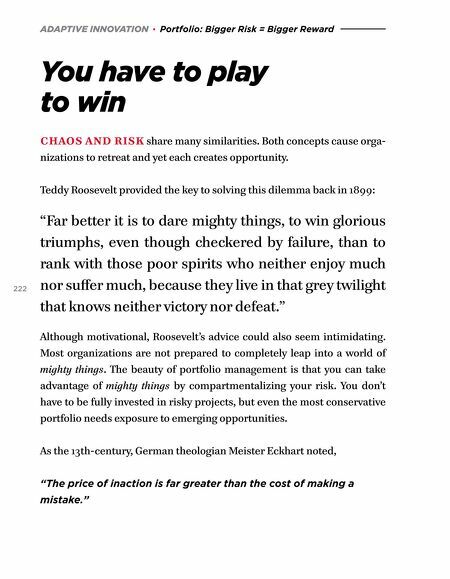 Teddy Roosevelt provided the key to solving this dilemma back in 1899: 222 "Far better it is to dare mighty things, to win glorious triumphs, even though checkered by failure, than to rank with those poor spirits who neither enjoy much nor suffer much, because they live in that grey twilight that knows neither victory nor defeat." Although motivational, Roosevelt's advice could also seem intimidating. Most organizations are not prepared to completely leap into a world of mighty things. The beauty of portfolio management is that you can take advantage of mighty things by compartmentalizing your risk. 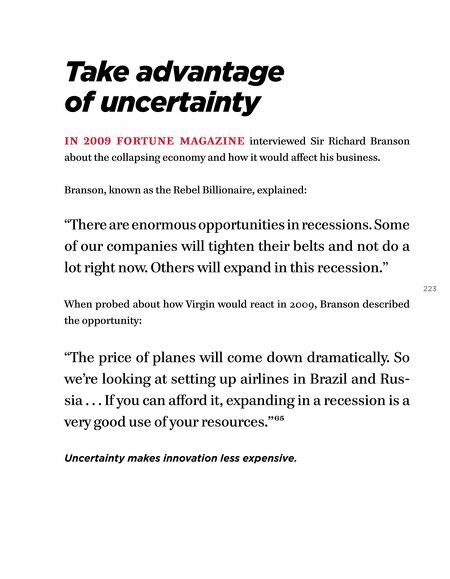 You don't have to be fully invested in risky projects, but even the most conservative portfolio needs exposure to emerging opportunities. As the 13th-century, German theologian Meister Eckhart noted, "The price of inaction is far greater than the cost of making a mistake."